Marion applied for the state housing authority's self build housing program. Having met the financial criteria the scheme allowed her to purchase land of up to a fixed value and allowed her a range of locations. 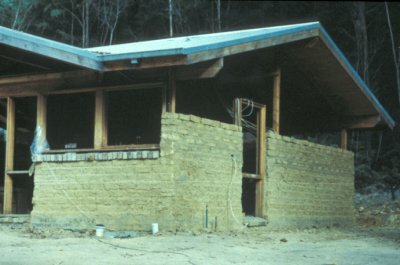 The program also provided the up front funds to build her house, again with upper limits. Home ownership was Marion's preferred tenure option. "I thought that if I put a lot of the labour in it would be cheaper to build than to buy an established home." Home purchase was an option for Marion, and she had her name down for other schemes, however "...the self build scheme was offered first." In this program self builders contribute their labour in lieu of cash and then own a share of the house. This share is usually refered to a percentage equity arrived at by comparing the market value of the house and the value of the mortgage. As the market value had not been established, it is not possible to say what % equity Marion holds in her home. Marion said "It all took longer than I'd imagined!" A very wet winter caused an eight month hold-up at the start of the project. It was not possible to get bulldozers or concrete trucks on to the site until it had dried out sufficiently. 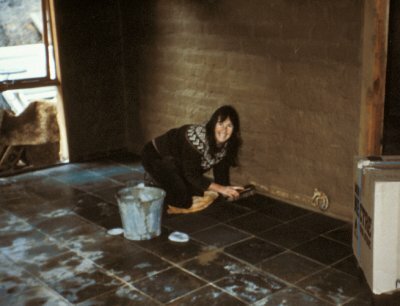 The longest part of the process was manufacturing and laying the mud-bricks, Marion said she had some "pretty wild mud brick working bees" with her friends. Laying the bricks proved a challenging task, the job became "progressively harder the higher the walls got". Marion said there were other delays due to weather and also her frame of mind. The solitary nature of the work was tough on Marion's emotional wellbeing. "Some days it was really hard to get motivated -mudbricking was wet and muddy and sometimes a cold job." Marion outlined this brief time line. 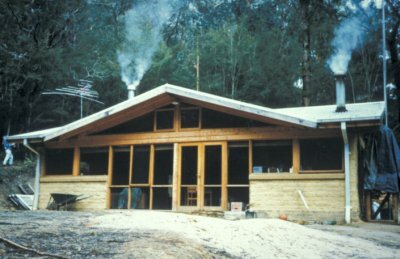 Marion said that she and her two children moved into "the not totally finished house" in the winter of 1991, "it was a lot better than the on site caravan". She continues to live in the house she built, but she worries that as the bedrooms are very small and there are only two there will not be enough room when her two children get older. The mudbrick working bee's, they were the good fun times. We'd make 500 bricks a day and there was plenty of champagne in the mix. Laying was the hardest part, it seemed to go on forever. Lifting the mud and bricks was just so hard, my relationship was breaking up and I hated the town, I was really burned out. Marion concluded positively: "anything is possible, step by step, the project unfolds, sometimes overwhelming, mostly buffered by family and friends. The house is part of me and is changing to reflect my needs. It sits comfortably on our beautiful bush block and is visited by native wildlife. It is simply beautiful, a wonderful achievement and wonderful part of my life." The case studies presented here contain photographs, illustrations and quoted material that is subject to copyright. Excerpts have been reproduced here with consent of the copyright holder.